James Burrill was born in Providence on April 25, 1772. He graduated from Brown University where he studied law. He served as Attorney General for RI from 1797 – 1814. 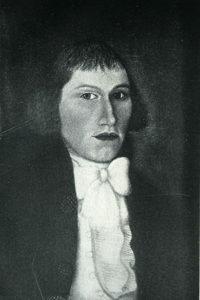 He was a member of the State House of Representatives from 1813 – 1816. He was chief justice of the state supreme court in 1816. And finally, he served as a US Senator for the state of RI from March 11, 1817 until his death on December 25, 1820. He died at the age of 49 of a pulmonary condition which afflicted him for many years. It was a shock to the Senate when he died and it was a great loss for the State of RI that he so faithfully represented. He is buried in Washington, DC. When James Burrill was Senator, our nation was confronting the issue of slavery. When a bill was brought before the Senate allowing Missouri to become a state, it included a clause that prohibited the introduction of slaves. Mr. Burrill made an impressive speech supporting this clause against slavery in Missouri. He was highly regarded by those who agreed and disagreed with his political opinions and everyone lamented his death. He was a good legislator, a statesman, an able scholar and wise judge. Many people ask if he lived in town. No, Mr. Burrill never lived in Burrillville. When Burrillville separated from Glocester in 1806, James Burrill gave the new town a set of books to begin record keeping. The town thought enough of James Burrill, his principles, his dedication and leadership and decided to name the town after him. On May 10, 2003, 183 years after Mr. Burrill’s death and 197 years after the town of Burrillville was formed and named after him, the Burrillville Historical & Preservation Society dedicated a monument to honor the memory of James Burrill Jr. We hope that the monument will serve as an everlasting reminder of the man for whom our town was named.